I have been making this dish ever since I can remember. It’s real comfort food for me, and makes me think of home – like that scrumptious dish your mother always prepared and you spend your life longing for. It’s so easy to make, and tastes so much better when it’s had a chance to rest a bit, giving the crust time to soak up the sauce. Give it a try. I am quite sure you will enjoy it as much as I do. Bring the water and salt to a boil. Mix the maize meal with the milk. Mix the milk mixture into the water mixture, and lower the heat. Mix the butter into this porridge. Add a bit of the hot porridge to the beaten eggs, and then add to the rest of the porridge. Stir in the cheese, and line out a baking dish with the porridge. Add the rest of the ingredients, except for the cheese, and let it simmer for 15 minutes. 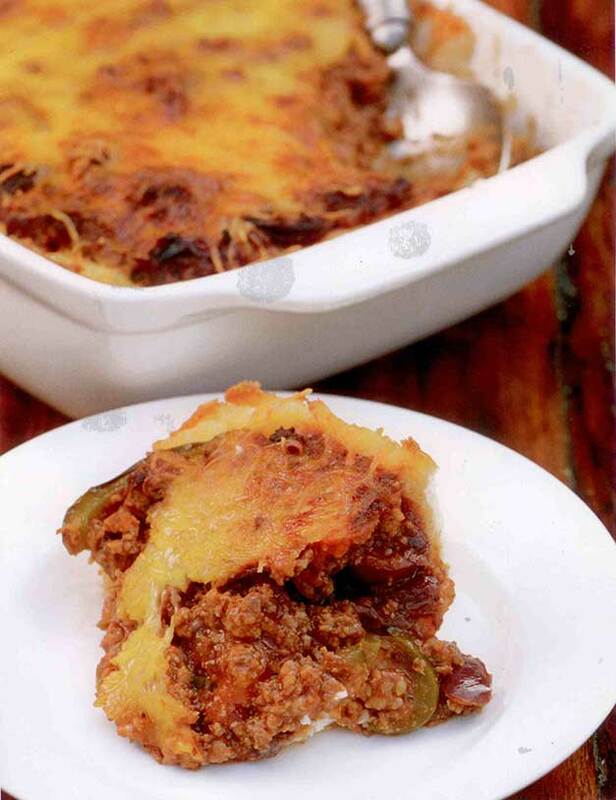 Fill the baking dish with the mince and sprinkle with the cheese. Let the pie rest for 10 minutes before serving.